I recently extracted tor-browser-linux64-6.0a4_en-US.tar.xz on a mounted drive. And tried to start the browser. The Browser didn't open due to not recognizing the .desktop file which starts the Browser. Later, I was advised to copy and paste it in home directory. And after pasting it in home directory, it no more shows permission problem or recognizing problem regarding the .desktop file by bash but now, it is showing permission problem in execdesktop file in Browser directory of Tor Browser's root directory. This message appears because you didn't gave executable permission to those files now you just go the /browser folder & make those files executable by typing ""chmod +x *"(without any quotes). 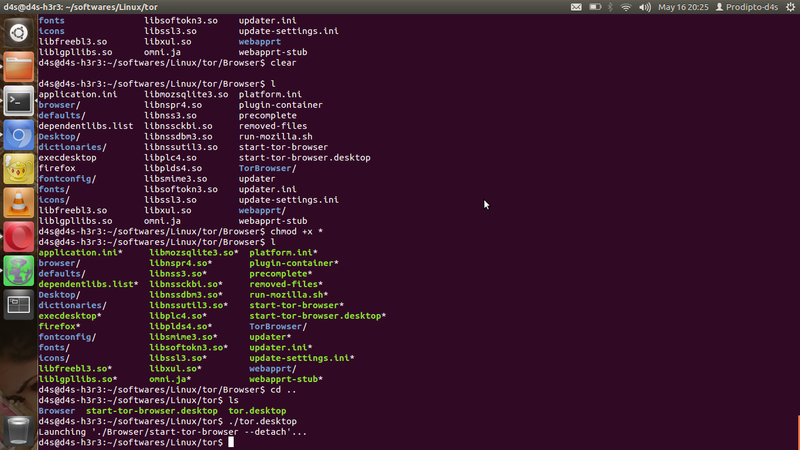 Now you will be able to run Tor Browser by executing "start-tor-browser.desktop" or "tor.desktop" any of these files. Not the answer you're looking for? Browse other questions tagged tor-browser-bundle directory ubuntu or ask your own question.